Miami students protest former president of Dominican Republic for ethnic cleansing law | Fight Back! 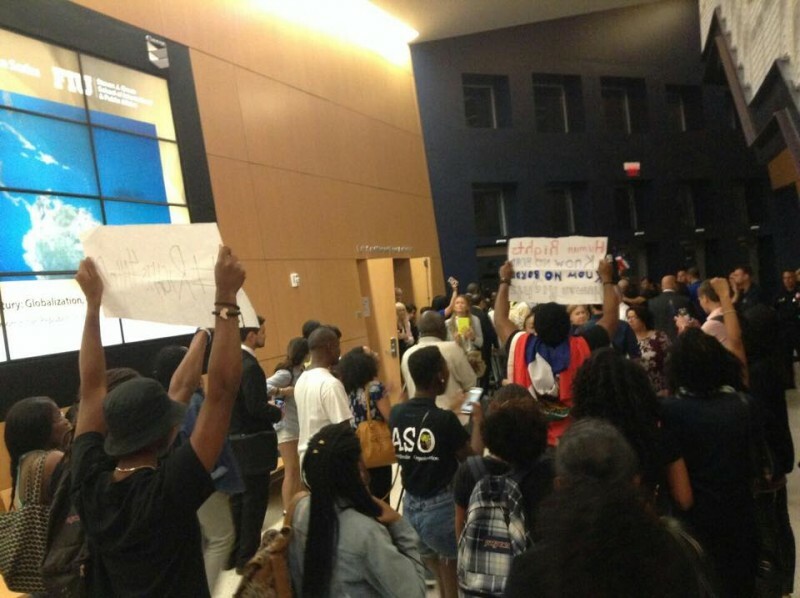 Miami, FL - Dozens of students in Miami converged on the campus of Florida International University, Oct. 23, to protest against Leonel Fernandez, ex-President of the Dominican Republic. Fernandez presided over the constitutional change producing the outrageous “TC 168-13” ruling. This high court ruling strips thousands of Dominicans of their nationality, affecting mostly people of Haitian descent. With the 2013 ruling, tens of thousands of ethnic Haitians born in the Dominican Republic are losing their citizenship - even those born to undocumented parents as far back as 1929. The ruling is forcing tens of thousands of Haitians and Haitian-Dominicans to be deported or flee. Racist mobs are attacking individuals deemed ‘Haitian,’ and in La Ortega this year, a racist mob attacked Haitian families, destroying and burning their property and expelling 300 people. “As a Black FIU student, I am very concerned with what is currently happening in the Dominican Republic. Since June we have seen thousands of Dominican Republic citizens of Haitian descent displaced, murdered and attacked after ruling TC 168-13 was passed,” stated Esi Fynn- Obeng, founder and president of the African Student Organization at FIU. Towards the end of Fernandez speech, students interrupted him and started chants of "Black Dominicans are Dominicans!" and "No Justice! No Peace!” They also chanted in unison, "Rights for all in DR," and "If we don't get it, shut it down!" “The purpose of this action was to denounce the Dominican Republic's racist policies and hold Fernández accountable for his actions. As a Haitian student, this is something very personal for me. Being in that room, while his supporters and others around the world are denying that ethnic cleansing is currently happening in the DR, is very upsetting. We have to do something about it!” said Hulya Miclisse-Polat, a University of Miami student and an organizer of the protest. The Dominican Republic imposed a June 17 deadline for hundreds of thousands of Haitians or Dominicans of Haitian descent living in the Dominican Republic to register with immigration authorities. Many see this as the first step toward deportation back to a country they were not born in or have not lived in for decades. Protests against the ruling are steadily building, including in the U.S. Protesters demand the Obama administration pressure the Dominican government to halt the deportations. Like in the U.S., backwards immigration laws and difficult to follow bureaucratic processes are being used to deny people their rights.